WVU's Medical Degree Program is composed of a diverse student body that is prepared for a range of medical career options in order to become physician leaders who can advance biomedical research and improve local, national, and global health. This is accomplished through curriculum in which students learn the core basic sciences in the first and second years and complete core clinical clerkships and scholarly investigation in the third and fourth years. Students entering the M.D. Program complete their first two years at the Morgantown campus and their remaining two years at either the Morgantown, Charleston or Eastern campus, depending on their assignment upon admission. Each campus experience offers a unique opportunity to engage in the local community and participate in clinical rotations at various partner hospitals and clinics around the state. The WVU School of Medicine encourages a vibrant, close-knit community across our three campuses in an environment where ideas and interests can be freely shared. We encourage students to express their unique personalities and this in turn paints a distinctive picture found at few other campuses across the country. 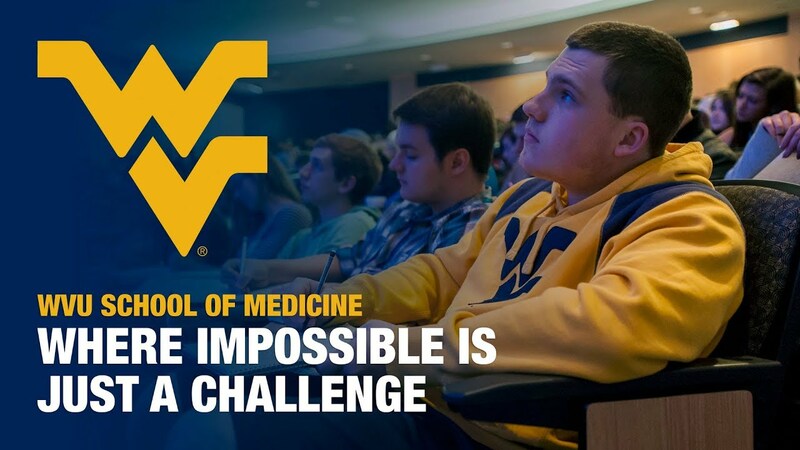 WVU SCHOOL OF MEDICINE - IMPOSSIBLE IS JUST A CHALLENGE. Take your first steps to becoming a Mountaineer. Get information about student organizations, profiles of current and former students, read Message of the Week and see previous award winners. The medical degree (MD) program provides a premium education to highly qualified students. Learning occurs in a nurturing environment that promotes health and wellness. Students participate in engaging classroom presentations, clinical and problem based learning groups, self-directed didactics and hands-on experiences in the world class simulation center.